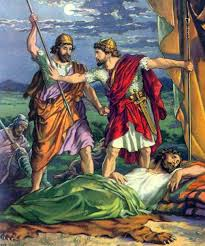 The Ziphites again tell Saul where David is hiding. Remember, the spy network is impressive. Saul takes 3,000 men with him to pursue David and his 600 men. Saul must have been worried David could take him down, bringing so many men against him. David’s men were the Mighty of the Mighty and had a reputation of defeating the enemy. Through spies, David learns Saul is near. He sends scouts to confirm and they came back to inform David that Saul is indeed near. The Army has set up camp and Saul is smack in the middle. The commander of the Army, Abner, placed his bed roll beside Saul and the army circles about them. David has a plan and asks for a volunteer to sneak into the midst of them while they are asleep. God put the army into a deep sleep so David and, Abishai one of his mighty men, could walk right in. There they are, smack in the middle of the sleeping army. Saul is fast asleep with his spear stuck into the ground at his head. He probably put it there for a quick grab if danger came. David crept closer and took Saul’s spear and his jug of water that was beside his head. Not one man heard or stirred in their sleep. “Who are you calling after the king?” Abner replied. David and his men went on their way. David showed great self-control. He could have killed Saul and been rid of the one trying to kill him but he didn't. Do you use self-control? Do you hold in your temper and attitude with people who make you angry? We can learn from David. We need to put out troubles into the Lord’s hand and trust Him to make it right. Also, we need to praise Him for all He has done and is doing for us. We need to bless His name. David wrote most of the Psalms in our Bibles. These were songs he sung unto the Lord. Some are about his troubles but most are praise songs to the Lord. Memorize: Psalm 92: 1 It is good to give thinks to the Lord, and to sing praises to Your name, O Most High.